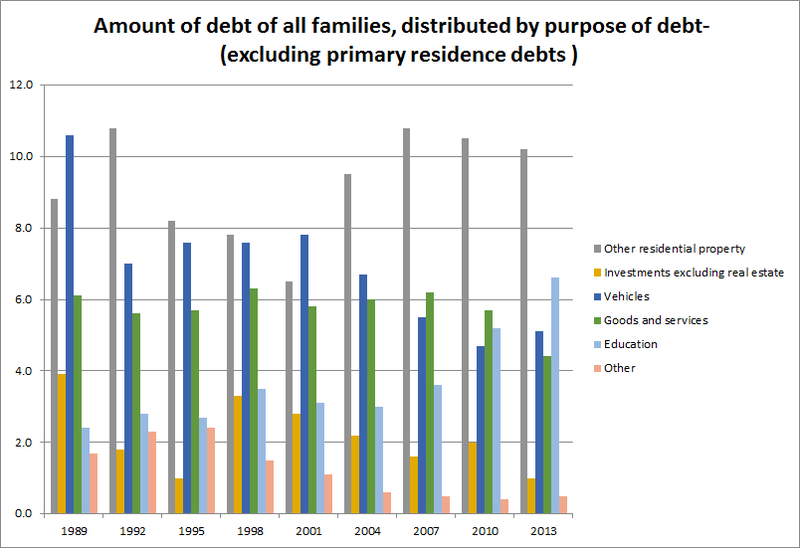 One of the points made in the Survey of Consumer Finances for 2013 report Changes in U.S. Family Finances from 2010 to 2013: Evidence from the Survey of Consumer Finances (PDF) is that debt levels are down in 2013 from 2010. Thats good. I decided to look closer at the figures for debts in the SCF. Immediately obvious is how much the debt for primary home loan mortgages overshadows all other forms of debt combined. 70% of our debt is home mortgages and another 12% is a combination of home equity loans and other residential loans (presumably rentals and/or vacation homes?). I'd also like to point out how this chart illustrates the horrible looming disaster that student loans pose to American families. What you can't see how awful the student loan bubble has become? Well yeah I guess it is kind of hard to see compared to that giant blue bar for home mortgages. Isn't it? Well the education debt level has gone up considerably in the past 20 years, no doubt about that. As of 2013 the education debt accounted for 6.6% of American debt and back in 1989 it was just 2.4%. On the other hand in 2013 vehicle loans are only 5.1% of our debt and in 1989 they were 10.6%. Hmmm. I guess I don't think thats bad that we've decided to pay for educations instead of new cars... but I suppose thats a personal opiniony kind of thing. Its a bit easier to see the growth of the light blue education debt bar there. 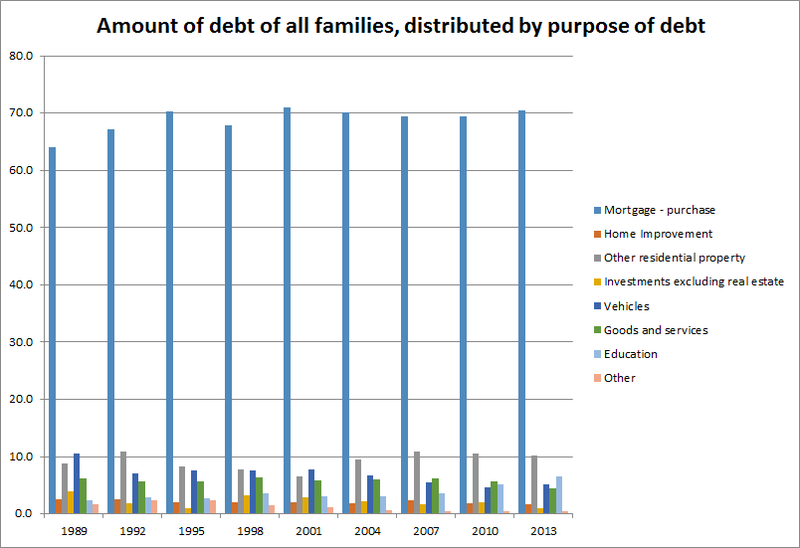 But its still not really standing out much versus the other forms of debt.